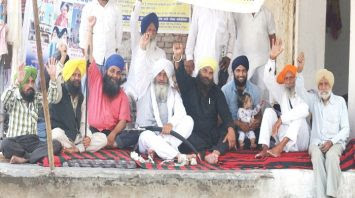 Posted: 14 Apr 2019 08:46 AM PDT TARN TARAN SAHIB, Punjab—The peaceful sit-in-strike of Sikh leader Karam Singh Bhoian seeking indictment of the demolishers of historic Darshani Deodi of Gurdwara Sri Tarn Taran Sahib today completed 14 days. A lot of Sikhs extended support to Bhoian’s struggle today by appreciating his initiative and discussing the future course of action with him. Speaking to Sikh24, Karam Singh Bhoian informed that the SAD (Amritsar) activists will take out a protest march in Tarn Taran tomorrow. He added that a memorandum will be submitted to the Deputy Commissioner demanding action against the demolishers of this historic Darshani Deodi. Pritpal Singh Amritsar, Balwant Singh Gopala, Kulwant Singh Kotlagujra, Mukhtar Singh Keedian, Balbir Singh Mundapind, Lakha Singh Marhana, Resham Singh Tarn Taran, Mohinder Singh Chautala, Rajan Singh, Kulwant Singh Majhail, Bibi Harjinder Kaur Khalsa etc. were present on this occasion.